OK, we admit, this is the ultimate in indulgent treats, but it’s one that’s perfect for the Christmas season. 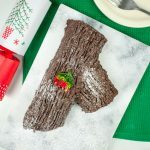 Rich, sweet and ridiculously addictive, this classic vegan yule log will wow even your non-vegan guests. Traditionally a yule log is made from a Genoise cake mixture, which uses eggs, so coming up with a vegan version was tricky but we were determined not to give up! A dozen or so cake mixtures later, we have come up with our own vegan version of the classic and we are super excited to share the recipe with you. 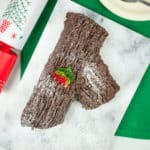 This yule log is on the small side, so simply double the ingredients if you want to create a larger version. The trick to making this cake is to be patient. When rolling the cake, roll slowly and gently, and make sure it’s fully cooled before you start spreading the buttercream frosting. The cake can be kept for up to a week. Preheat the oven to 200°C or 390°F and lightly grease a Swiss roll tin with oil. Then line the tin with baking paper and grease the baking paper with oil to ensure the cake doesn’t stick. Pour the aquafaba into a food processor and blend for roughly a minute until it turns white and fluffy. Then add the sugar and process again until the aquafaba and sugar are fully combined. Add the flour, cocoa powder, applesauce and vanilla extract to the food processor, and gently process until all the ingredients are fully combined. Pour the cake mixture into the Swiss roll tray and tap gently against the tray until the mixture is level. Bake the cake in the preheated oven for 10 minutes. Remove the cake from the oven and run a knife around the edges. Then leave it to cool for 5 minutes. Dust the top of the cake with icing sugar. This will ensure the cake doesn’t stick to itself when you roll it. Line a chopping board with a tea towel and carefully invert the cake onto the tea towel. Gently peel off the baking paper and dust the bottom of the cake with icing sugar. Very slowly, start rolling the cake from one of the longer edges using the tea towel for friction. Make sure you roll the cake with the tea towel inside, then leave the cake to cool completely. Meanwhile, make the buttercream frosting by processing all the ingredients in a food processor or with a whisk until the cream is light and fluffy. Once the cake has cooled, very carefully unroll it and put the tea towel to one side. Don’t worry if there are a few cracks because these will be covered by the buttercream frosting. Using a knife or an offset spatula, place half of the buttercream frosting onto the cake and smooth it out. Leave a cm gap around the edges so the buttercream doesn’t spill out when you roll the cake. Roll the cake back up again and transfer to your serving plate. Use the tea towel again if it makes it easier to move the cake. 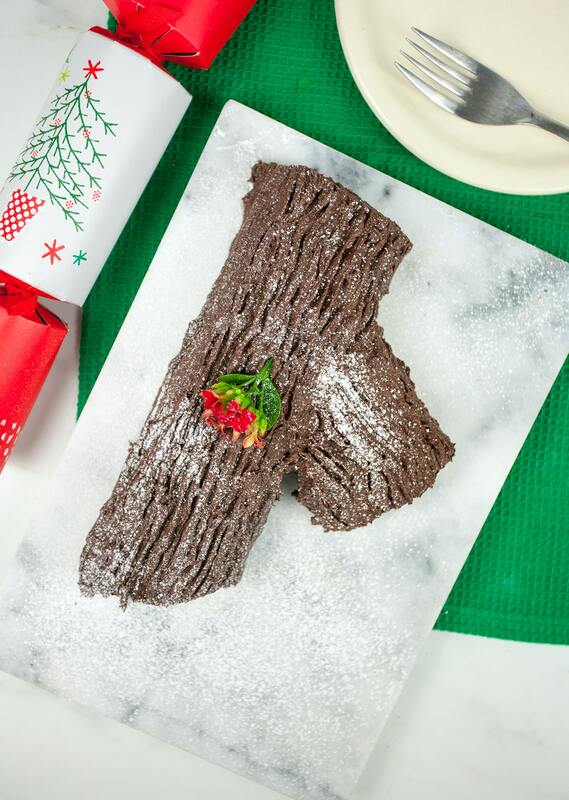 To create a small branch, cut a one inch slice and position it against the yule log. Cover the cake with the remaining buttercream frosting, then run a fork over the outside to create a bark-style pattern. Dust with icing and serve. Did you nothing how much aquafaba ( in ounces or gram or tablespoons ) you got from the tin of chickpeas ? I ask because there’s a big difference in af amounts in various brands. I’ve seen from 2/3 cup to a full cup from same size, but different brands of chickpeas. That is just perfect! I use this recipe for my swiss roll and it was delicious! Hello, my family doesn’t own a food scale. And so, I was wondering if the weight measurement is necessary, or if there are volume measurements that would work just fine. If so, what are they? What is “applesauce” and where would I get it? Roxy have you tried making this gluten-free and vegan? After trying a different recipe that was a total disaster I gave this one a go and the sponge was delicious and held together beautifully! Only issue is that it makes a very thin sponge so quite a small log- do you reckon doubling the ingredients will create a thicker sponge? Thanks so much for the recipe! I just finished making this recipe and I doubled the recipe to make a larger log and it is perfect in size. The cake rolled beautifully and no cracks. Smells delish and looking forward to having it Christmas Day. Thank you for the recipe! Made this yesterday – looks really good, had a sneaky taste and was very nice but today when I looked, a syrupy puddle is forming around the base – any ideas why or what this could be. Made exactly according to recipe. Looks great! What size Swiss roll tin do I need to get?